This Free Beginner Video Drum Lesson continues on from a previous lesson where I showed you how to play some of the simplest and most common drum beats that every drummer should know. For most drum beats, the snare drum is only played on beats 2 and 4 of the bar. This is known as the snare drum “Backbeat”. But to give a drum groove ‘feel’ and ‘movement’ drummers can also play extra snare drum notes in the bar. By placing extra snare drum notes in and around the backbeat the drum beat can be pushed and pulled and made more interesting musically. 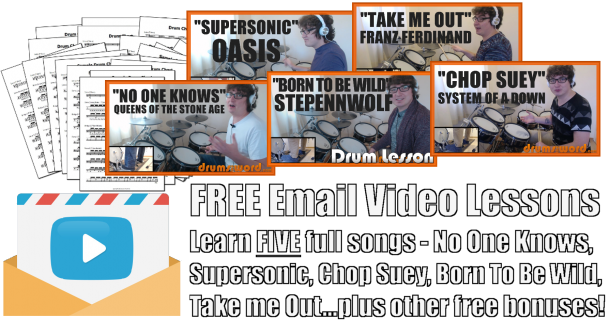 In the free video beginner drum lesson below I show you some of the most common and popular snare drum patterns. These patterns will help to make your drum beats more interesting and will give them movement.